Remember when people went absolutely berserk for these psychedelic rainbow bagels? Bagel fanatics would spend hours in line for a taste of neon, multi-colored bread -- it was undoubtedly one of the wildest, and earliest, food trends of 2016. It wasn't long before these gorgeous chromatic twists hit the beauty scene. And with that, we introduce to you Shine Line Hair. We're in complete awe of this gorgeous new trend. According to Allure, this look isn't achieved in the same old fashioned way highlights or ombre are applied. No, it's a completely new art that takes loads of imagination, creativity and go-with-the-flow attitude. In a nutshell, stylists apply bright and neon hues to the hair in diagonal or overlapping splashes. The stylist artist has to envision how the colors mesh or complement one another, and how the colors will appear from different angles in the light. "Typically, the roots and ends are the same color, so the rainbow sits in the middle of long locks, which is the element that separates shine lines from the rest of the colorful hair trends out there right now," Allure explained. 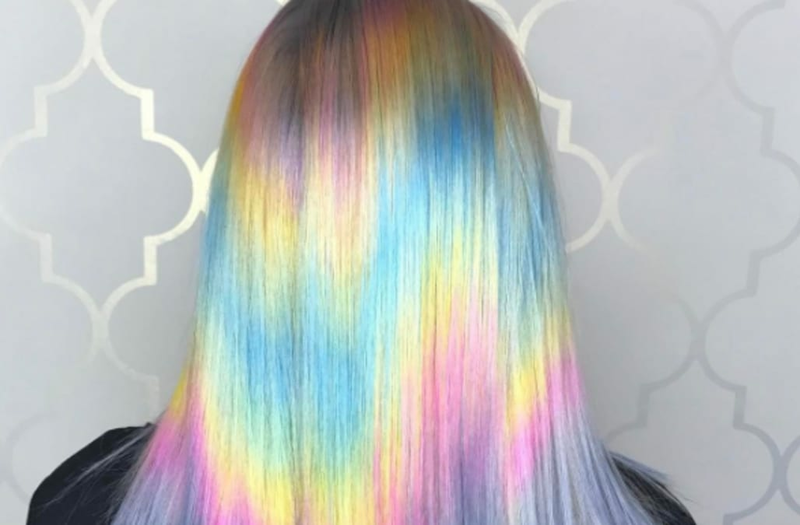 "The finished product looks like a rainbow prism hitting the hair 24/7," the publication said. It's magical.